Totally listening to that song right now though. Looove Guns N’ Roses. I had so much fun making this painting (well… I know, I say that everytime). 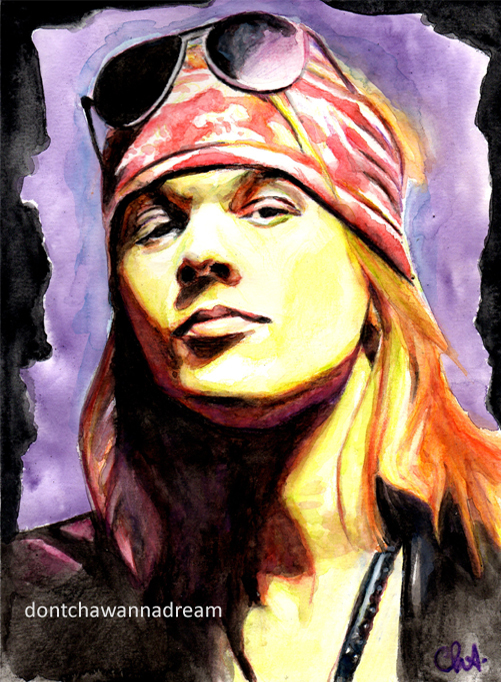 But come on, Axl Rose is a ROCK LEGEND. Next one on my list : Steven Tyler. Yayyy. By the way, I love the story behind the cover art of Use Your Illusion I and II (made by Mark Kostabi). It’s actually a stylised detail from Raphael’s School of Athens… Yep, that’s enough to impress me. My God daughter Becky sent me a postcard when on holiday of my favourite group ‘Stone Roses’. So glad to know you love their music too. I’m a ‘music junkie’, I buy tons of new albums but sometimes it’s good to listen to old CDs too (and why not TAPES) lol. Thanks a lot, Lauren!! 🙂 Big hugs. With the strong lighting, this one looks even more three-dimensional than usual. Very nice, like always, Cha. Ohhh cool! I didn’t really realize it was more ‘3 dimensional’ as you said. Yes, I noticed the way you use strong lighting, and it’s very effective. It’s like your trademark! Beautiful piece Cha! The attitude is right there – nice work! Eheh Rock’n’Roll! Thanks a lot, Mary. It’s a photo, isn’t it? Fantastic! Lol Thank you, Nuno. Nooo, I’m not patient enough to paint all the little details. Usually I focus on the face and that’s it.